Update: The correct release date is 19th April, not 12th as previously stated. Senile Team's Rush Rush Rally Racing is on the way to Europe in two weeks. 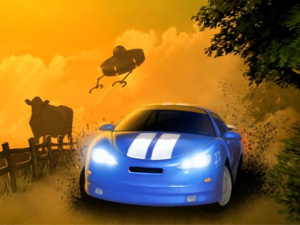 The indie racer — first developed for Dreamcast, fact fans — was first announced for WiiWare in August 2010, but the wait is due to be over on 19th April for 900 Nintendo Points. Up to four players can take part in top-down races that call to mind old-school games like Micro Machines, Super Cars, Super Sprint and more. Here's a trailer of the Dreamcast version — expect the WiiWare outing to be nearly identical. I have two words... not... interested. This just looks blatantly horrible... the demise of the Wii continues. No wonder Wiiware doesn't get much great games on it now, just waiting until the Wii U shines. Just a couple days ago I was wishing the Wii had a Micro Machines style racing game. Hope this one is decent. This is hopefully better than the other Micro Machine clones on the service: Monochrome Racing and MotoRoader. Actually I've got this game on Dreamcast. It's not bad at all. 900 points is a good price. Great news. Wanted to play this but couldn't be bothered getting it for my DC, which is a bit dodgy. Great that they're not only doing it for the DC but on a more mainstream medium as well. Played quite a bit of this on gamescom 2010 and liked it a lot. Kinda like a "racing only" version of the original GTA. What's not to love. Interesting, reminds me of Excessive Speed. One of my favorite top down racers.